The Dizhsa Nabani – Lengua Viva – Living Language pilot debuts today! Check back here every Thursday for a new episode! 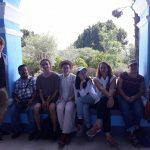 On Thursday, Katie, Edward, Kathryn, Lucia, and Hilary met Moi in the town of Teotitlán to film an interview with artist Gabriela Morales Cruz. Gabriela, originally from Tlacochahuaya, is a visual artist who studied in Mexico City and now does printmaking in her workshop. Later in the same day, the same crew drove to Tlacochahuaya to interview two musicians that play in the philharmonic band that Maestro Pepe (who Moi had interviewed a few weeks before) directs. 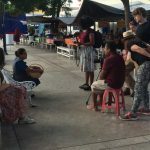 They spoke about participating in a tradition that has historically been male-dominated and how playing traditional music helps them to feel closer with their Zapotec identity. 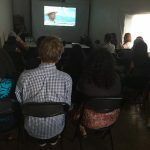 On Friday evening, we were joined by Dr. John Foreman and three of his students from University of Texas Rio Grande Valley, as well as Margarita Martinez, a Zapotec speaker from San Pablo Macuiltianguis. 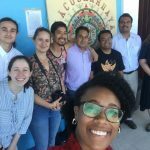 We had a great exchange with this group–we shared our progress on DocuLab, and they shared with us a trilingual (Macuiltianguis Zapotec, Spanish, English) storybook that they had created with beautiful illustrations. Margarita even read one of the stories for us. After, we all hung out and had a cookout dinner at the hotel. 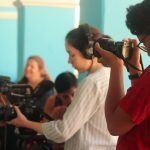 Saturday was a wildly busy editing day, because on Sunday we screened our work-in-progress at the municipal building in Tlacochahuaya. We showed a video about the process of using bulls to plow corn fields that was narrated by Antonio, Moi’s father, and we also showed an introductory video to the project which shows Moi discussing the goals of Dizhsa Nabani, the features of Tlacochahuaya, and his own Zapotec identity, interspersed with clips from all of our shoots thus far. Several interested folks from town attended the screening and some shared their thoughts afterwards. It was awesome to finally see some of our work on a projector screen and to hear from people in the community we hadn’t met. 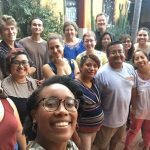 On to our last week in Oaxaca…! We had a big week of shooting! We just hit the halfway point of our time here in Oaxaca, and it’s time to get as many shoots in as we can before it’s crunch time for editing. On Wednesday we went to La Era, one of Moi’s family’s corn fields, where we filmed bulls plowing the field. This was the first of two plowings that takes place every harvest. 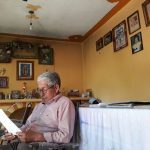 We interviewed Moi’s dad, Antonio García Crúz, who spoke to us about the process of plowing with bulls. 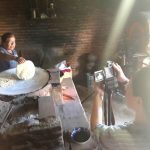 On Thursay we filmed Moi’s mom, Angélica Guzmán Martínez, making chocolate using the metate (grinding stone). On Friday, we filmed Moi and his students in a demonstration of Moi’s Zapotec classes. Five students, representing a range of ages and including both boys and girls, showed up. In the class, Moi went over counting, greetings, and introductions with the students. After the demo, we showed the kids the ‘Word of the Day’ project on our tablet. It satisfying to see young people, our crucial audience, engage so well with the Instagram page. Moi would have the students point to a word so they could guess what it meant. Then he would swipe to the video of him speaking the word, and finally swipe again, for the final reveal where the word is depicted through an moving image. After the kids went through all the words, Moi asked them if they would like to be part of the project. The children all chose a word to say in order to contribute to the project. On Saturday night, we stayed overnight in Tlacolula de Matamoros, so that we could wake up early the next morning to film the Sunday market before it became too crowded. We interviewed Moi’s mom, Angélica, about her experience selling garbanzo and black beans in the market. The fellows are excited about the plethora of footage we’ve acquired this week, and even more excited to see what lies ahead! This week, the team filmed interviews with Moisés García Guzmán, Angélica Guzmán Martínez (Moisés’ mom), and their family friend, José Ángeles Martínez. We interviewed Moisés on the big hill (Dany Nagas, as he called it in his variant of Zapotec) overlooking the town of Tlacochahuaya. 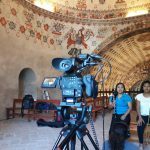 During the interview, Moi provided an overview of our project and of the town to provide context to those that will be viewing our film who aren’t familiar with Tlacochahuaya, Zapotec, etc. 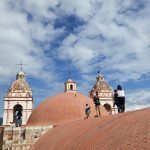 While the crew was in Tlacochahuaya, we revisited the church to observe a new perspective of the town from its roof. We also had the wonderful opportunity to interview José Ángeles Martínez, dearly known as Maestro Pepe. Maestro Pepe is a Zapotec musician and music teacher who has been a long time family friend of Moi’s. Maestro Pepe gave us his perspective of how he imagines himself as Zapotec through his music and how he used to be a conquist, or a ‘conquest performer’. He thinks the younger generation of dancers don’t understand the gravity of dancing la danza de la pluma, also known as ‘the dance of the feather’ and ‘the conquest dance.’ He explained that there is importance in understanding the aspects of the conqueror, or Spain, in harmony with the aspects of the conquested, or Zapotec and other indigenous people. He also read us a story in Zapotec and Spanish for us to film. Afterward, we interviewed his wife Irma, who sells tejate –a chilled corn based drink– from their home. To end our visit, we all got to try Irma’s refreshing and filling tejate. 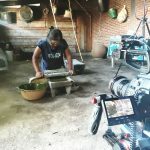 Finally, we visited Moisés’ home to film his mom, Angélica Guzmán Martínez, cooking frijoles con hierba de conejo and tortillas while explaining her process to us. Angélica heated corn on a comal, ground it into masa on her metate, and then formed memelas and tortillas to be cooked atop the comal. 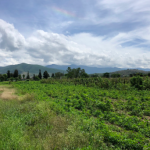 Hierba de conejo is a wild herb native to Oaxaca and Angélica went through an extensive and intensive process in order to cultivate its growth in the backyard. Adding it in the beans gave them a very distinctly Oaxacan flavor and pairing the beans with the tortillas after they were done was a delicious midday snack for the team. After the shoot, we met with Moisés for a production meeting to solidify planning for more interviews, schedule more shoots, and discuss what our long term goals for the project were. 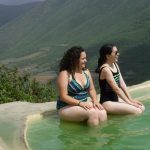 To end the week, the team visited Mitla and Hierva el Agua, literally “the water boils.” Hierva el Agua is a set of rock formations including petrified waterfalls and swimmable pools of water loaded with minerals. 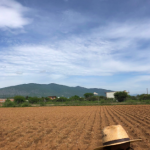 Being able to observe the environmental wonders of Oaxaca has been amazing to have alongside our everyday learning of the people living within. We began shooting this week, and it’s off to a great start. For our first shoot, we drove to Tlacochahuaya to meet Moi and his friend and neighbor, Reimundo, who are both corn farmers. 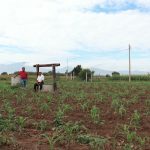 We filmed the pair having a conversation in Zapotec about farming practices, what it means to be Zapotec, and the importance of corn while they sat on a well in Moi’s cornfield (which is called Xayanuez, meaning “under the walnut tree”). We also got some lovely shots of the cornfields and the surrounding mountains in which the valley sits. On our way back, Brook showed us to Dainzú, a Zapotec archaeological site. 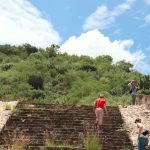 Along with the site’s extensive stonework, we saw preserved bas-reliefs of Zapotec glyphs and a Mesoamerican ballgame court. After another day of further planning and media management, the crew drove out again to Tlacochahuaya, this time to speak to the town’s president, Eleazar López Martinez, and the minister of education, Adrian Morales García. 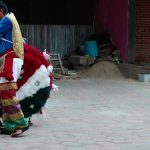 They spoke about their own Zapotec identities—Adrian, for example, performs in the danza de la pluma, a Zapotec dance, which is performed on Tlacochahuaya’s holy day in September. The interview reflected the work of Zapotec language activists like Moi. While the officials did not fluently speak Zapotec, Adrian used some Zapotec words, and spoke about the process and importance of teaching Zapotec to young Tlacochahuayans. They have brought in various Zapotec teachers and have incorporated Moi’s Zapotec workshop into the early education curriculum of the town. The following day, we had our final shoot of the week with Pablo Serna in his home-based workshop. Pablo makes headdresses for Zapotec dancers (such as Adrian) both in Tlacochahuaya and other towns. 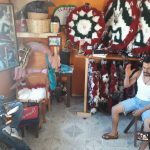 We filmed an interview in Zapotec between Moi and Pablo, and afterwards Pablo demonstrated how he makes the headdress. Pablo also donned the whole outfit of a danza performer and demonstrated the dance in his courtyard. 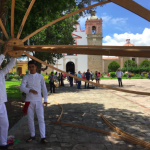 We spent the first week learning about the larger context in Oaxaca, especially as it relates to Zapotec people, history, culture, and languages. On our first day in Oaxaca, we went to the market in Tlacolula. We bought some groceries there and also saw an advertisement for the Guelaguetza being filmed in front of the church. On Tuesday, we visited the Biblioteca Francisco de Burgoa. David Karminski Katz—the Administrative Coordinator—gave us his best 30 minute overview of the sociopolitical history of Mexico in order to give us a better idea of the context in which contemporary Oaxaca and conversations around indigeneity are situated. 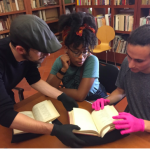 David presented us with a few grammars and dictionaries that either described indigenous languages or translated between Spanish or an indigenous language, like Mixtec. 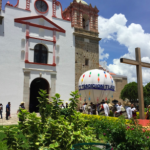 We made our first of many trips to San Jerónimo Tlacochahuaya on Wednesday. Moisés met us at his house and he showed us around his family’s farm and church. We have also eaten some amazing food this week, prepared by Yaneth Molina, her mother Augustina, and Abigail Mendoza. Yaneth was part of the Voces de Valle twitter project and tweets in her variety of Zapotec that comes from the Isthmus. She is now attending culinary school in hopes of becoming a Zapotec Chef. 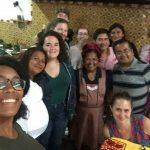 On Thursday, we had some pre-Hispanic Zapotec cuisine at Tlamanalli, a restaurant run by Abigail Mendoza and her sisters in Teotitlán del Valle. Among her many accomplishments, Mendoza has represented indigenous Mexican cuisine in front of UNESCO in Paris and was featured in an episode of Parts Unknown with Anthony Bourdain.